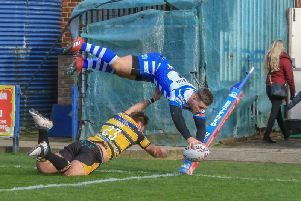 Halifax have terminated the contract of prop Luke Ambler by mutual consent, leaving the former Ovenden junior free to concentrate on his growing portfolio of off-field interests. Ambler, who joined his hometown club from Leeds almost six years ago, has made headlines away from rugby league with his ‘Andy’s Man Club’, a charity dedicated to cutting suicides among young men. Ambler’s brother-in-law, Andy Roberts, took his own life at the age of 23. The project’s runaway success has impacted on Ambler’s ability to train with his teammates and he has not featured in Richard Marshall’s side for several weeks. Courier Sport understands Ambler now intends to take some time away from the game before deciding on his long term future, although neither club nor player seem to have a closed the door on a return for a front rower who, at 27, should have his best years in front of him. “Luke has been a model professional and an outstanding member of the Halifax team,” said chairman Michael Steele. In a statement, Ambler said: “I leave the Halifax club on the very best of terms, and, who knows, I may be back. “I am a proud Halifax lad, who has lived the dream of wearing the iconic blue and white hoops. “Once I arrived at this club, I have never wanted to play anywhere else. “In recent months it has been hard to fulfil the training regime, and at the moment, I can only see it becoming harder.